We think you would agree that we live in a broken world. Broken families, broken friendships, broken hearts, and broken lives litter the landscape as far as the eye can see. Promises mean nothing, loyalty is non-existent, jobs are scarce. There is no one to turn to, no one we can count on. Or is there? Our vision is a Bible in every jail and prison cell across the United States bringing the power of God's word into the lives of those who need Jesus desperately. Our goal is to help incarcerated individuals recognize that they have value in the eyes of Jesus and that they have not been forgotten by Him. We strive to be laborers in the Lord's vineyard preparing people for His imminent return. To that end, Binding Broken Hearts ministers to the spiritual needs of inmates in county, state, and federal correctional institutions in the United States by providing free Bibles, personalized letters, and Bible studies. To each incarcerated individual who personally requests a Bible, we send a black bonded leather, large print, Andrews Study Bible. This individual will also receive a Bible study lesson and a personalized letter responding to questions and concerns every month. 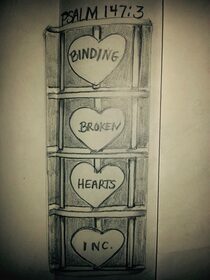 Binding Broken Hearts began in 2009. In 2010 the ministry distributed 20 bibles in 7 facilities in 3 states. God has grown this ministry so that at the end of 2015, we distributed 6,006 Bibles and regularly write to 4,607 inmates in 264 facilities in 29 states across the country.